The Library of America published its Ambrose Bierce collection in September, and we were taken by surprise when the first printing sold out barely three weeks after publication. Extensive reviews have appeared nationally in newspapers and magazines, including The Wall Street Journal, The Atlantic, and most recently The New York Times Book Review. 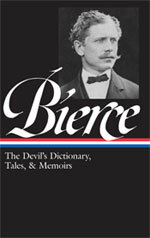 Although Bierce’s Devil’s Dictionary has always remained popular, who knew there was such pent-up demand for the short stories written by a writer who vanished forever in the Mexican desert nearly a century ago? Needless to say, we’re delighted to have contributed to what may well be the beginning of an Ambrose Bierce renaissance. We have previously offered two of his works (“The Moonlit Road” and “The Eyes of the Panther”) to Story of the Week readers; both were tales of the supernatural. But Bierce was (and is) also famous for his war stories, which he based on his own tenure in the Union Army during the Civil War. Motivated by a youthful patriotism, Bierce enlisted for three months’ service in April 1861, merely a week after the attack on Fort Sumter that opened the war. By early June, he was seeing action in western Virginia and was present at the Union victory at Philippi. A month later, a newspaper report commended his heroism when, under enemy fire during the battle of Laurel Hill, he carried a wounded soldier to safety. Soon after, he reenlisted for three years and subsequently participated in several of the war’s major battles, including Shiloh and Chickamauga; he was seriously wounded by a bullet to the head at Kennesaw Mountain. In story after story, he begins with minutely detailed descriptions of the hostile landscapes his soldiers—often sentries or scouts—find themselves in: terrain that must be attended to closely, and with sleepless vigilance, for signs of an enemy’s movements. . . . It’s as if every charged moment of his military service were still etched in his memory, persisting as only the most disturbing sensations can. Fear is indelible. The scholar David M. Owens has called “A Horseman in the Sky” Bierce’s “most memorable use of the lone sentry motif,” and it is certainly one of his most well-known and widely anthologized stories. Joshi has remarked on the vast influence stories like this one had on other writers, including Stephen Crane and Ernest Hemingway, and readers who recall Jack London’s “War” (a Story of the Week selection from last year), which was written two decades later, will notice a few similarities to Bierce’s tale. But unlike London (or Crane), Bierce is writing from his own experiences as a soldier; “A Horseman” is set near Grafton, a town now in West Virginia that was occupied in late May 1861 by Union troops whose number included Bierce himself, newly enlisted and only nineteen years old. One sunny afternoon in the autumn of the year 1861 a soldier lay in a clump of laurel by the side of a road in western Virginia. He lay at full length upon his stomach, his feet resting upon the toes, his head upon the left forearm. His extended right hand loosely grasped his rifle. . . . If you don't see the full story below, click here (PDF) or click here (Google Docs) to read it—free! A superb story, one I hadn't read before. I was very surprised by the ending. A great tale by a venerable writer. Here's a master story teller. I wish more of our current story men knew as well as he how much to say and when to be silent. Americans, when they chose a republic, knew they were placing themselves in a universe that would test them in ways hardly imagined by their ancestors. I wish more of their children were up to the task, but it isn't numbers anymore, is it? Each of us has to ask him/herself what the story means and none of us can be sure where our answer comes from. Poignant, illuminating and historically important. A delightful insight into idealism and realism of the American Civil War. An enthralling tale of the poignancy and hardships of the Civil War. A gifted and prolific author as well. Simply put: A GREAT read! Loved "...some invisible messenger of fate touched with unsealing finger the eyes of his consciousness - whispered into the ear of his spirit the mysterious awakening word which no human lips ever have spoken, no human memory ever has recalled."